The Society has at present 388 members of which 9 are honorary members, 263 are ordinary members and 116 are foreign members. 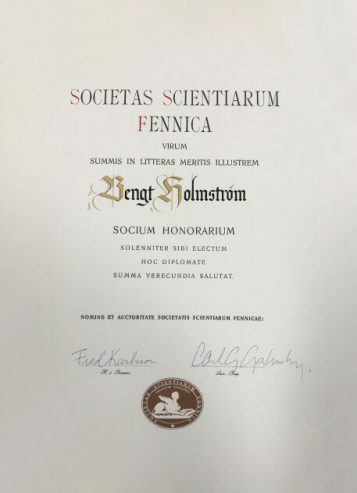 DSocSci, Academician (Academy of Finland), emeritus professor of sociology at the University of Helsinki, regular member of the Society since 1961. PhD, Academician (Academy of Finland), emeritus professor of mathematics at the University of Helsinki, regular member of the Society since 1968. PhD, emeritus professor of Physics at Nordic Institute for Theoretical Physics (Nordita), Copenhagen, Nobel prize in Physics 1975. JD, Academician (Academy of Finland), emeritus professor of Civil Law and International Private Law, foreign member of the Society since 1981. MD, Academician (Academy of Finland), emeritus professor of Medical Genetics at the University of Helsinki, professor of Human Cancer Genetics at Ohio State University, regular member of the Society since 1975. PhD, emeritus professor of history at the University of Helsinki, former president of the Society, regular member of the Society since 1977. PhD, emeritus professor of Greek Philology at the University of Helsinki, former Permanent Secretary of the Society, regular member of the Society since 1963. PhD, professor of economics and management at Massachusetts Institute of Technology, the Central Bank of Sweden Nobel Memorial Prize in Economic Sciences in 2016, foreign member of the Society since 1992. 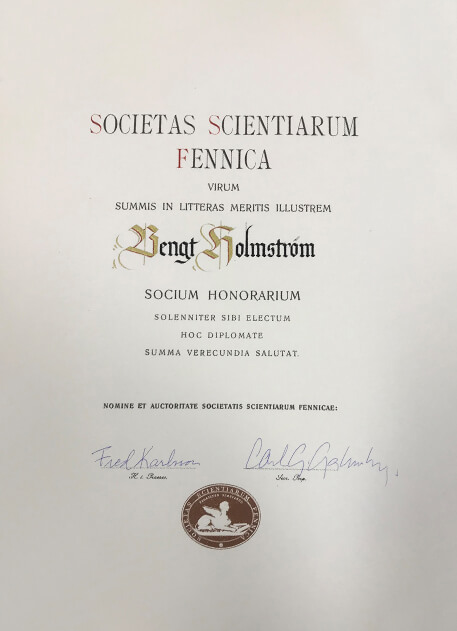 MD, emeritus professor of biochemistry at the University of Helsinki, former Permanent Secretary of the Society, regular member of the Society since 1983.